Cone beam computed tomography (CBCT) was introduced to the European market in 1996 with the NewTom 9000 machine, and reached the U.S. market five years later. I still vividly recall sitting in on my first CBCT lecture, at the 2002 Moyers Symposium. Dr. David Hatcher wowed me with his presentation and opened my eyes regarding the value and benefit of radiology in dentistry—especially with CBCT and 3D imaging. I also remember walking the exhibit floor at the Midwinter Dental Conference in Chicago the following year, evaluating different CBCT machines, and coming across one that had a reconstruction time range of 1 to 24 hours for a CBCT scan, and with radiation exposure levels of 200 microsieverts and higher to the patient. In my opinion at that time, with the ridiculously long reconstruction times and high radiation exposure levels, this machine was basically useless in a busy orthodontic practice for everyday use on patients. Fig. 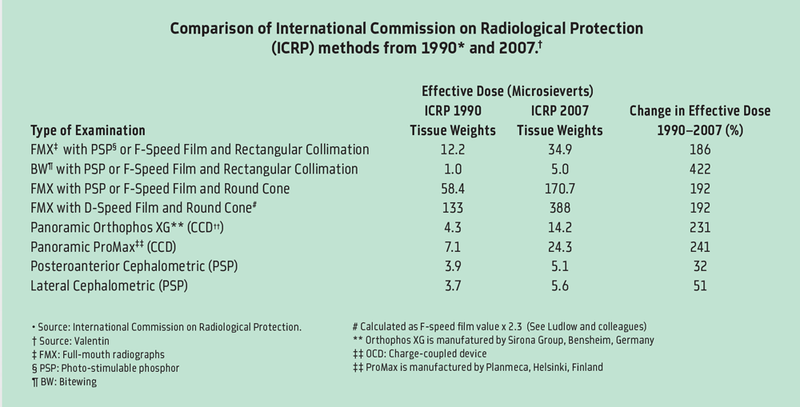 1 Sources: Ludlow, J; Davies-Ludlow, L; White, S: Patient Risk Related to Common Dental Radiographic Examinations: The Impact of 2007 International Commission On Radiological Protection Recommendations Regarding Dose Calculation, J Am Dent Assoc. 2008;139,1237-1243. This brings me to the very valid fears and concerns that most practitioners had with CBCT back in the mid- to late 2000s: high radiation exposure levels to our patients. Traditionally in orthodontics, a standard set of radiographs consists of a 2D digital panoramic X-ray (24.3 microsieverts) and a 2D digital lateral cephalometric X-ray (5.6 mSv), which equates to approximately 30 mSv of radiation exposure to the patients. (See Fig. 1.) This is the baseline now typically used in orthodontics when comparing “safe and acceptable” patient radiation exposure levels in CBCT machines. However, not all CBCT machines are the same, and there are key factors in controlling the amount of radiation exposure levels to the patient. I was an early adopter of CBCT; in summer 2005, my practice bought an i-CAT Classic machine for our private orthodontic practices. It was a major decision, with a price tag of $225,000, and we made our choice because at that time, that particular machine had the fastest reconstruction times and the lowest radiation exposure levels, with safety concerns for our patients as the primary determining factor. Having an excellent understanding of the key factors involved in the selection and purchase of a CBCT machine for our practices was critical for me and my two partners, to make sure it was the right fit for our first machine. I believe that many of these same key factors exist today for any practice owner who’s considering the purchase of a CBCT machine, because not all machines are the same. I’ll discuss each, and specifically, I’ll focus on my experiences with the CBCT machines we’ve purchased and utilized in our practices over the past 13 years. Fig. 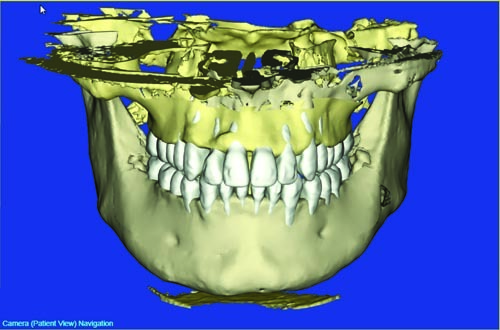 2: i-CAT/SureSmile scan depicting bone fenestrations and dehiscences with a maxillary cant. Fig. 3: Using SureSmile’s software to center the roots in the alveolar trough and correction of the maxillary cant. Fig. 4: Superimposition of the maxilla, mandible and dentition over the smile photo to depict the maxillary cant. Fig. 5: Correction of the maxillary cant over the superimposed smile photo. 1. Size and placement. Based on the size and design of the CBCT machine, the manufacturer should provide you with a basic footprint and design for your CBCT room and help you work with a radiation physicist in your state to design the room to meet state regulations. For the state of Wisconsin, we had to use lead-lined drywall for our CBCT room and lead-shielded glass for our viewing window for the protection and safety of our patients and team members. 0.3 voxel for all initial, progress and final records. 0.2 voxel for scans to create digital segmented models with brackets to complete our SureSmile setups, or for larger adolescent patients and adults if we feel we need sharper images. the 4.8-second scan for a great majority of our initial and progress records, and always for our final records. the 8.9-second scan for the initial records only for larger adult patients, or if there is some pathology or trauma present that would require a sharper image for diagnostic purposes. 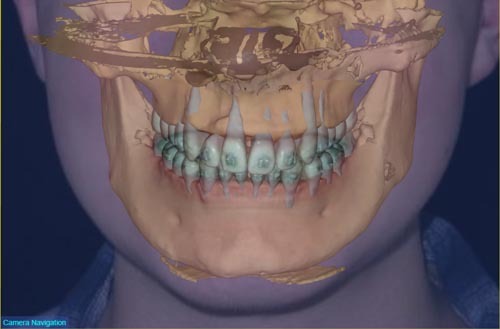 the 14.8-second scan for our SureSmile scans, because we need a higher-resolution image to have precise tooth and bracket modeling to generate the customized wire to set the patient’s bite into an ideal occlusion within the alveolus and for a customized smile design (Figs. 2–5). We never utilize the 26.9-second scan in our practices. 4. Field of view. The i-CAT FLX comes with several default settings that can be collimated on a touchscreen panel. In our practices, we are very conscious that a larger field of view (FOV) essentially means greater radiation exposure levels to the patient, so we are clear with our assistants about which FOV at which to take CBCT scans. In our practices, we really use just four standard FOV settings. 8cm by 8cm. For checking on specific locations, such as evaluating an ectopic eruption path of a maxillary canine. 8cm by 16cm. Essentially the FOV of a Panorex. We typically use this setting for most of our initial records scans for children 11 and younger; we don’t need a larger FOV for lateral cephalometric X-rays unless there’s a large anterior/posterior or vertical discrepancy. 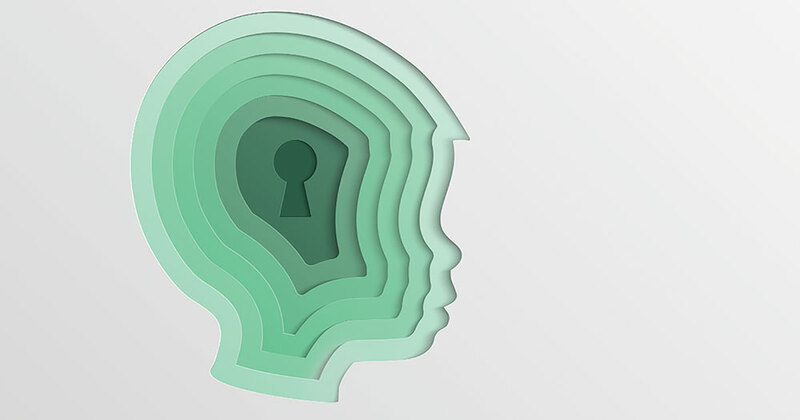 We follow the ALARA principle here—“as low as reasonably achievable,” which gives us the capability to keep radiation exposure levels lower to younger children who are more sensitive to radiation. 13cm by 16cm. Essentially the FOV for a lateral ceph. We use this setting for initial, progress and final records of all full fixed appliances cases for adolescents and adults. 17cm by 23cm. For large adolescent and adult patients if we require a lateral cephalometric X-ray. We take this scan only a handful of times per week, at most. 5. Radiation exposure levels to patients. This is, without a doubt, a factor that all clinicians need to be fully aware of for the safety of their patients. Radiation exposure levels to the patient are primarily determined by resolution or voxel size, scan time and FOV; however, a fourth factor was introduced in the late 2000s with the development of the low-dose CBCT scan—the biggest single improvement with CBCT machines in the past 10 years. In traditional CBCTs, the scan was captured with a single, 360-degree revolution of the X-ray source, pulsing in a cone shape around the patient’s head to the sensor (Fig. 6). The low-dose CBCT scan evolved to a 180-degree revolution of the X-ray source around the patient’s head to the sensor; as a result, radiation exposure levels to the patient are greatly reduced. All newer-model CBCT machines come with a low-dose setting. Our i-CAT FLX has two low-dose settings, QuickScan and QuickScan+. Both scans last 4.8 seconds, but the latter emits fewer pulses of radiation in the 180 degrees of revolution, resulting in lower radiation exposure levels. In what I consider to be two landmark articles, Drs. John Ludlow and Cameron Walker have provided excellent evidence-based research related to the significant decrease in radiation exposure levels of different CBCT machines using the low-dose settings.1,2 According to their study, the radiation exposure range in our i-CAT FLX machines is 4–171mSv (Figs. 7–8). With the QuickScan+ and QuickScan settings, the range of exposure is 4–70mSv; with the 8.9-second scan, 30–120mSv. The third setting we use, a 14.8-second scan at a FOV of 8cm by 16cm, was not evaluated in the study, but my best educated guess is that the radiation exposure for this scan is approximately 100 microsieverts based on the other study results. 6. 3D imaging software and integration into your practice management system. When we purchased our i-CAT Classic in 2005, the imaging software that came preloaded with the machine would allow us to create images in 2D only; there was no 3D software. We recognized that we needed 3D imaging capabilities with CBCT at every single clinical chair. Our practices run on Dolphin Management and Imaging, which the previous year had just developed Dolphin 3D Imaging software, which we ended up buying. At that time, our only other alternative was Invivo by Anatomage, which also is an excellent 3D imaging software application, but we chose Dolphin 3D for clinical efficiency so that all of our 2D and 3D images could be saved in one software application. This eliminates the need of having to use two separate software applications for the same patient. Today, the i-CAT FLX comes preloaded with TX Studio, the company’s software user interface application and its 2D and 3D software imaging application. It’s excellent and can also be linked to other imaging software applications, but it will be the decision of each dentist how to integrate 3D imaging into his or her practice. 7. Price. If you’re in the market for a CBCT machine, you need to have a budget in place and understand how you can finance this. The cost of CBCT machines has come down significantly—especially over the past five years—because of increasing competition in the market and also following the trend with all technologies where costs decrease as the technology becomes more mainstream. However, in my opinion, the phrase “you get what you pay for” truly applies when purchasing a CBCT machine. Such an important piece of technology is one area where you don’t want price to be the No. 1 determining factor in the purchase. Image quality, clinical efficiency, reliability of the CBCT machine and support are all critical factors in having an excellent-functioning CBCT machine in your practice. Fig. 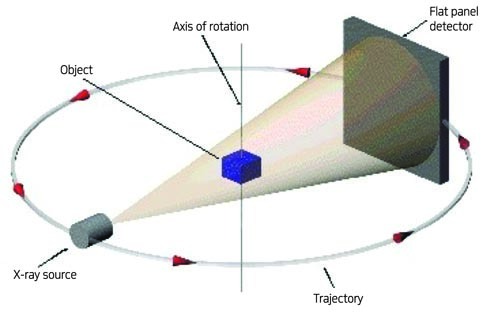 6: Standard cone beam computed tomography, 360-degree revolution. Fig. 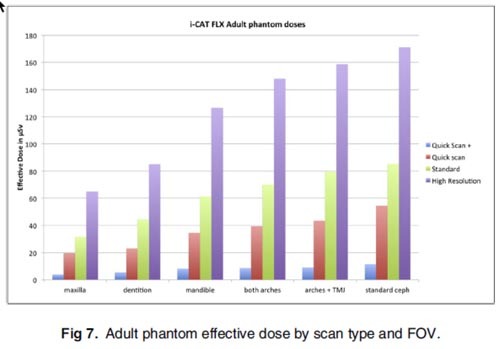 7: Adult phantom effective dose by scan type and FOV. Fig. 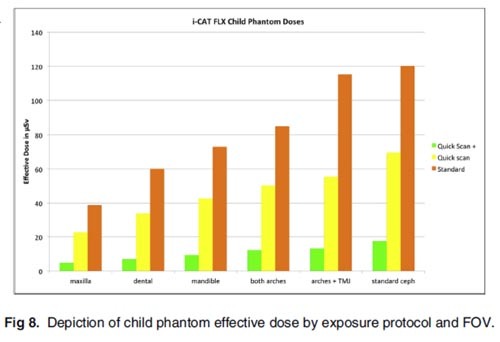 8: Depiction of child phantom effective dose by exposure protocol and FOV. Time certainly does fly by … and as you get older, the years fly by faster. I cannot believe it has been 13 years since we first integrated CBCT into our practices! Also, technology almost always gets smaller, better, faster and cheaper. Looking back on my experiences with CBCT, this saying truly applies to the evolution of CBCT in dentistry and orthodontics. I hope this summary of my thoughts and experiences with CBCT will be a useful guide for anyone interested in learning about CBCT. Finally, I must first give recognition to three people for whom I have the utmost respect and whom I consider to be my mentors on CBCT. As a young orthodontist I sat in on multiple lectures by each of these individuals and picked their brains on many occasions over the years. Thank you, Drs. David Hatcher, James Mah and Bruce Howerton, for all your friendship, guidance, knowledge and wisdom, which you have so generously shared and passed on. You’ve helped our profession to advance the safe utilization and invaluable benefits of CBCT for diagnosis and treatment planning in our practice of orthodontics for our patients. 1. “Assessment of Phantom Dosimetry and Image Quality of i-CAT FLX Cone-Beam Computed Tomography.” AJO-DO, December 2013. 2. “Effective Dose of Dental CBCT—A Meta Analysis of Published Data and Additional Data for Nine CBCT Units.” DentoMaxilloFacial Radiology, January 2015. 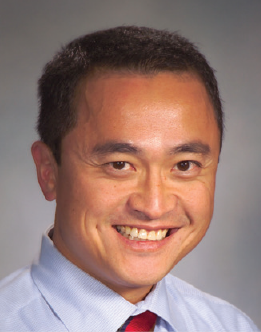 Orthotown editorial board member Dr. Ed Lin, DDS, MS, is one of two partners at Orthodontic Specialists of Green Bay, with two private practice locations in Green Bay, Wisconsin. He is also one of two partners at Apple Creek Orthodontics of Appleton. Lin received both his dental and orthodontic degrees from Northwestern University Dental School and is a recognized industry leader on CBCT, SureSmile, temporary anchorage devices, intraoral scanning and 3D printing. He is an internationally recognized speaker who has written several articles that have been published in a variety of dental journals. Lin has also lectured at several orthodontic residency programs across the United States.